The irony here is rich and it really is hard to know where to begin. Homelessness is among the biggest problems we face as a nation; and yet it is also a problem we steadfastly choose not to see. Who among us has not averted their gaze at one time or another from those sleeping on park benches or beneath underpasses, or those holding signs seeking money for food, as if to imagine that if we don’t see them then they aren’t really there. 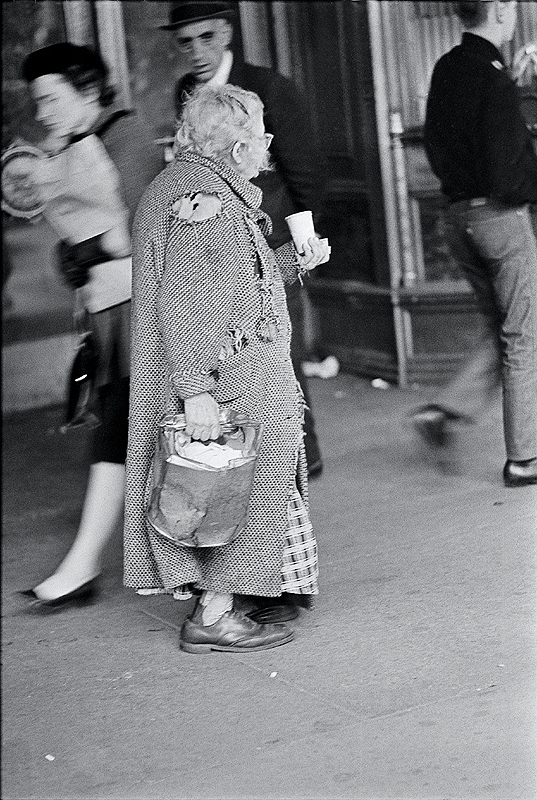 And what better way to avert our collective vision than to romanticize the homeless person as the “bag lady”—the eccentric and often addled but loveable older woman, carrying her possessions from spot to spot, refusing the help of social services, and often driven by a maternal instinct that fights its way through the layers of mismatched, threadbare and disheveled clothing she dons. Never mind that this is no longer the face of poverty and destitution—if it ever was; it helps us put a public veil on what is otherwise too hard (or inconvenient) to confront. Ignorance, as they say, is bliss. Seeing is believing. ← Previous PostSight Gag: "Reality has a well known liberal bias." I really enjoyed this post, and by way of extending the discussion, offer some thoughts about other uses of the same image of the bag lady. Here I think the effect is quite different. The ACLU/skid row story says little about homelessness; it’s more about advocates and laws than people experiencing homelessness. It leaves us to fill in who the homeless are and how they must live (a gap, as you point out, filled so troublingly by the overly nostalgic print for sale). But that gap doesn’t exist in all stories about homelessness. In the article about Najera, we know exactly who the homeless are (defenseless citizens at risk) and how they are treated (cruelly murdered through a total disregard for their humanity, both literally and figuratively). When a story of this kind offers such a characterization, the print for sale takes on a radically different meaning: it seems to me that it’s no longer about making poverty a commodity for enjoyment, but about critiquing the unwillingness to look at the homeless, to engage individuals in a way that asks who they are and what their fates will be if we continue to ignore them. In the print, the bag lady walks away from the viewer, suggesting to me that we have long allowed the problems of the homeless to get away from us, and we do so to our own peril. In examples where the print is paired with a story about cruelty against the homeless, it seems to offer us a choice: we can continue on an outdated path of indifference or blissful ignorance of the problem, which may turn us into monsters, or we can get involved, make a difference, strive for justice. In this way, the photo memorializes the moment when we have to make that decision. The homeless woman is always there, but always just about to get away. In these cases, her fate as well as ours hangs on the decision we make. Nicely put, Melanie. And yet another instance of how capitalism inadvertently deconstructs itself. Or do you mean to suggest that the Times recognizes that it is positioning the photo as a memorialization of the moment of decision? I think it’s most likely that the Times has some sort of plug-in that automatically inserts an ad for a print topically related to the article, with unpredictable results. But it’s interesting how the pairing of the print for sale with particular stories can change the argument of the story. With the Najero piece, you wonder what drives people not just to ignore the homeless, but to actively hunt them down, and when you scroll down the page to the ad for the bag lady print, you get the answer: a long history of America’s indifference to the homeless.